Currently viewing the tag: "the catoctin banner"
Blair Garrett and James Rada, Jr. Whether it’s in the grocery store, your local food chain, or volunteering for a charity in need, elders continue to pitch in and help the community around us. Thurmont resident Margaret Reed, age eighty-seven, has put in countless hours over the years, working a variety of jobs. To this day, Reed still works. She aims to keep herself busy and moving. “I love to work, and I always have,” Reed said. Her working career started off at a young age, back when it was necessary to have the whole family chip in to help. She began working at fifteen years old at Kresge’s 5 and Dime, making 35 cents an hour. At sixteen, Reed moved on to Sagner’s in Frederick, sewing clothing, where she got a significant bump in pay to 50 cents an hour. “I thought I was rich,” she recalled. That youthful attitude and determination was not age-relative for Reed, though, as she has carried youthful optimism throughout her life. Reed flourished in a long career, and she had decided to enjoy retirement at sixty-two years of age. But after forty years of marriage and the passing of her husband, Reed got back into the workforce to get out of the house, where she took a job at the Carriage House Bakery. She spent sixteen years there until her second retirement this past December. But even at eighty-seven, Reed couldn’t stay dormant for long, taking her current job, on-call, cleaning at the Super 8 Motel in Thurmont. Seeing her friends using walkers and oxygen is motivation for Reed to stay active, and keeping busy is the best way to maintain her independence. Darlene Wastler is another example of perseverance and dedication. Wastler, age sixty-six, maintains a job at the Roy Rogers in Thurmont, where her smiling face is often the first thing new and old customers see when they visit. She also works at the Thurmont Senior Center, offering help week after week. Wastler is a Catoctin local, born and raised. 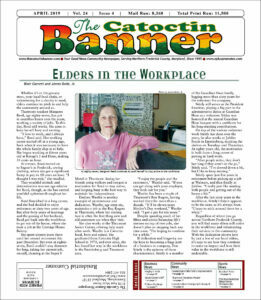 She graduated from Catoctin High School in 1970, and ever since, she has found her way in the workforce in the Emmitsburg and Thurmont area. If dedication and longevity are the keys to becoming a huge part of a business or company, Don Stitely is the epitome of those characteristics. Stitely is a member of the Guardian Hose family, logging more than sixty years for the volunteer fire company. Stitely still serves as the President Emeritus, playing a big part in the administrative duties at Guardian Hose as a volunteer. Stitley was honored at the annual Guardian Hose banquet with a certificate for his long-standing contributions. 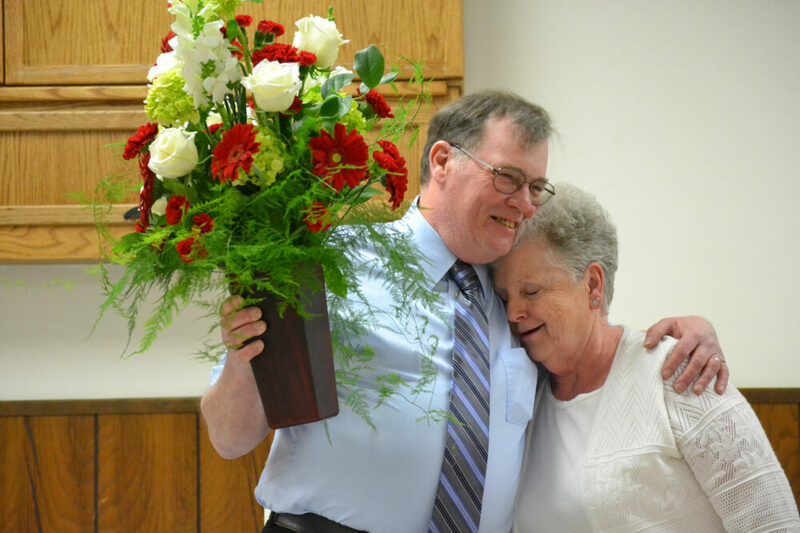 On top of the various volunteer work Stitely has done over the years, he also works at Jubilee Foods in Emmitsburg, stocking the shelves on Tuesdays and Thursdays. At eighty years old, the motivation is built from a long career of putting in hard work. Regardless of where you go across Northern Frederick County, you will find many elders still active in the workforce and volunteering their services to the community. With the dedication shown here by just a few of our local elders, it’s easy to see how they continue to make an impact and how their value in the workforce is still undeniable. 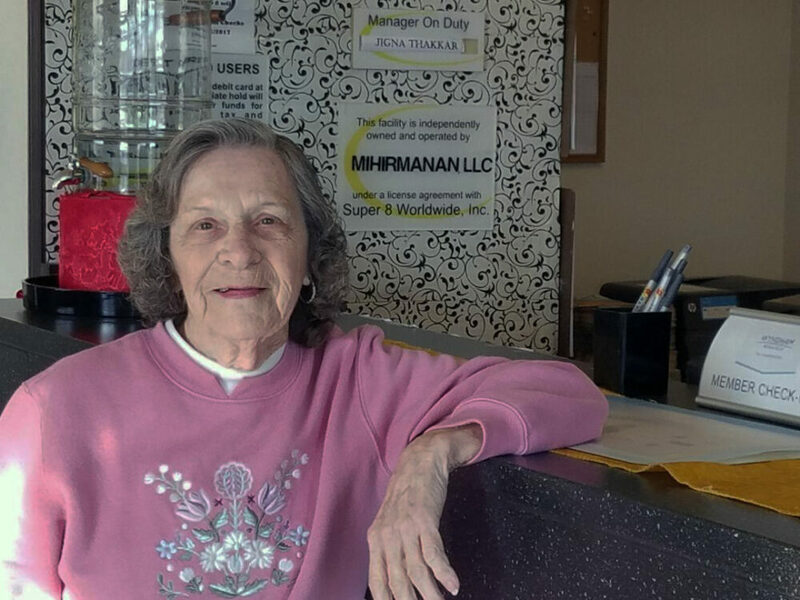 At eighty-seven, Margaret Reed continues to push herself to stay active in the workforce. The Emmitsburg Board of Commissioners continued its review of the proposed changes to the town’s sign ordinance. During the March town meeting, the commissioners heard about the proposed changes to what types of signs could be located in which areas of town. They also paid particular attention to lighted signage. 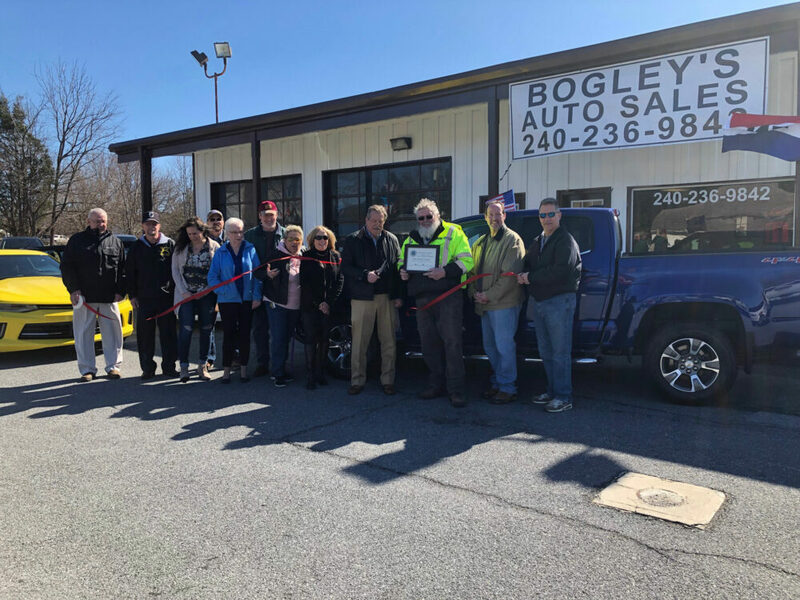 They reviewed off-premise signage, which Town Planner Zach Gulden told them is a “totally new and business friendly section” to the sign ordinance. Gulden told the commissioners that the new ordinance brings the town up-to-date with new signage technology, into compliance with legal rulings that could lead to future court challenges, and adheres to the best practices recommended by the Maryland Municipal League and American Planners Association. Town staff also said they planned on taking pictures of all of the signage in town that is non-conforming to the whatever sign ordinance is eventually passed. This will create a visual list to show what signs are grandfathered in under the new ordinance and avoid any new town staff in the future to cause a business owner problems because they have signage not allowed under the sign ordinance. The Emmitsburg Commissioners supported a project proposed by Sandra Adams and Wayne Slaughter to create a half-mile-long walking path surrounding the Community Park baseball field into a nature trail garden. The project will use volunteers to remove debris and prepare the garden beds. The maintenance costs are expected to be minimal, and they hope to raise the amount through donations. The commissioners voiced their support of the project, and Adams and Slaughter will start to move forward with it. The roof of the Emmitsburg Food Bank building is in need of $40,000 of repairs to stop leaks and mold mitigation. “I don’t know whether it’s even worth it,” Food Bank Director Phyllis Kelly told the Emmitsburg Commissioners. Kelly asked the town commissioners if they could help the food bank find a new location. The commissioners directed her to contact the town planner, who could help the food bank with its search. Emmitsburg must pass a cross connection control program or face fines from the State of Maryland. However, they put off the decision for a month to better understand the ordinance that the state is requiring them to pass. The program is designed to protect the potable water supply from contamination by connecting backflow preventers to water lines. Once passed, businesses will have time to make the changes while residents will only need to make the addition to their home water lines when major changes are made to the home or it is sold. The .7-mile-long Thurmont Trolley Trail may not be long, but it is well used by residents. The H&F Trolley Association would like to see the trail grow and attract even more users. Members of the association presented their plan to Thurmont Town Commissioners. The plan calls for extending the trail north to Eyler Road Park and south past the water treatment plant. The hope would be that it might eventually connect up with other hiking and biking trails. The projected cost to extend the trail to be two miles long would be $190,102. Thurmont Police Officer First Class Brian Donovan was named the Thurmont Lions Club Police Officer of the Year. Donovan has served in the department for three years and performed many traffic stops. He has also administered Narcan three times to overdose victims, most likely saving their lives. He also serves as the lieutenant of the Guardian Hose Company. Donovan received a gift certificate to the Shamrock Restaurant and will have a $400 donation made to the charity of his choice. The Thurmont Commissioners have begun compiling their wish list of projects that could be funded through Program Open Space grants. The division of funds will emphasize property acquisition. Among some of the suggested projects are to increase the size of Community Park and to create a pocket park in Catoctin Heights. The commissioners also expressed no interest in pursuing a skateboard park, which was on the town’s POS wish list last year, but dropped. The Thurmont Mayor and Commissioners will be reviewing proposed regulations to the Thurmont subdivision regulations at the regular town meeting on April 9. A public hearing will be scheduled for a later date. This year marks the 50th anniversary of Seton Center. What began as a day care center to meet the needs of local preschool children and their families has grown into a community landmark, a place of “Hope in the Valley” for our neighbors who aren’t simply looking for a handout, but are seeking a way to improve their lives. To celebrate this legacy, Seton Center is hosting a “Welcome Home to Seton Center” party on May 4, 2019 from 1:00-4:00 p.m. on the grounds of the new building at 226 E. Lincoln Avenue in Emmitsburg. It’s an opportunity to reconnect with old friends and see what a difference fifty years can make! This is a free event, with games and activities for children and adults, raffles, door prizes, and light refreshments. It all started in 1969, when a small band of mothers advocated for a safe place to send their preschool-aged children, where they would be nurtured and given the opportunity to learn about God and caring for one another in the community. The Daughters of Charity answered the call. Over the years, the center grew to accommodate a thrift store and outreach office. While the “Blue School” ceased operations in 2013, having finished its faithful service, the programs established to meet the changing needs of Northern Frederick County community continue. Come back and see that while some things may have changed—most notably, Seton Center’s new location—the most important thing hasn’t: the mission to work with its neighbors to build a hopeful future in the spirit of Saint Elizabeth Ann Seton and Saint Vincent de Paul. Get information on the various programs offered by Seton Center, such as free Build Your Resources seminars, which give important tips like buying a car without getting ripped off, starting a savings plan, and caring for your mental health. During the reunion party, the Seton Family Store will be open until 3:00 p.m. Browse the current selection of quality items and see how the support of the Family Store helps the outreach programs operate. Seton Center relies on the generosity of donors and funds from the store to continue helping our neighbors in need. Seton Center has sustained for the past fifty years because of volunteers, clients, donors, and staff. It’s because of the determination of mothers like Cheryl Bushman, Nancy Cool, Elise May, and Marlene Springer that Seton Center got its start, and it’s the dedication of people like the Daughters of Charity who keep it going. Please join in celebrating the past fifty years, and come be part of the next fifty. 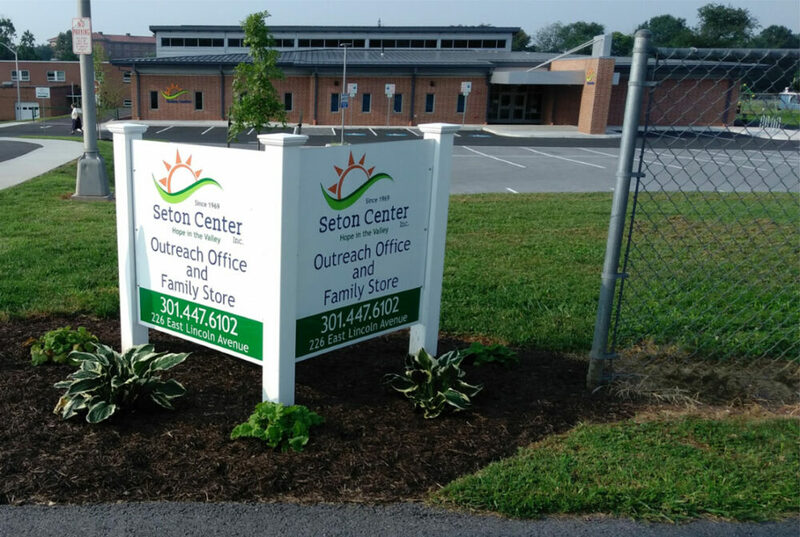 Seton Center’s new location at 226 E. Lincoln Avenue in Emmitsburg. Sam Zanella (pictured right) is a 2014 graduate of Catoctin High School and the FCPS Career and Technology Center’s TV Multimedia Program. Sam is an employee with Creative Technologies, Inc. in Los Angeles, California. 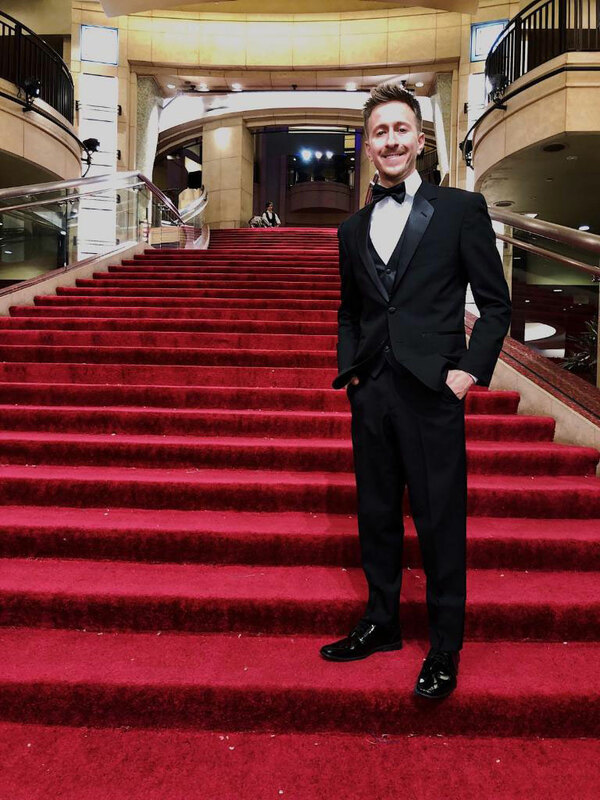 Sam recently worked as an Audio Technician in the Press Room at the 2019 Oscars, working along with press from throughout the world and the 2019 Oscar winners. Sam now resides in Burbank, California. 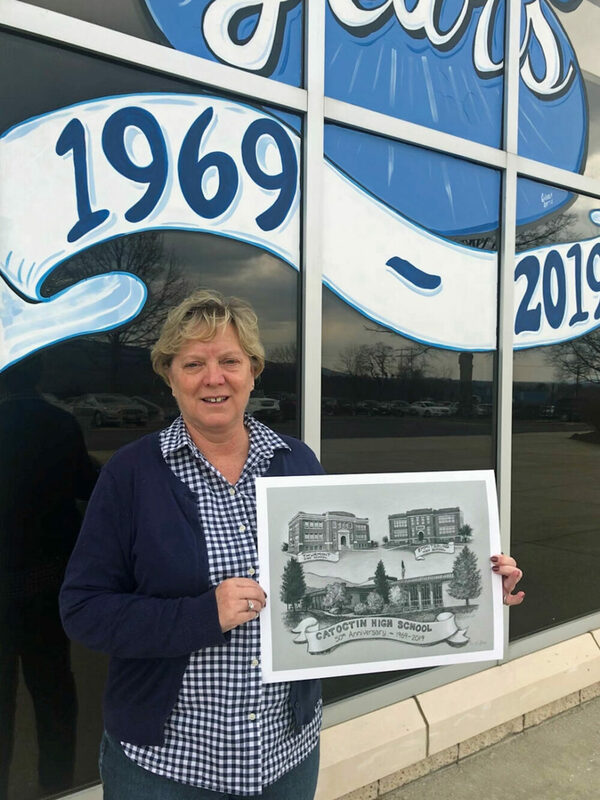 Catoctin High School is selling limited edition, custom-made art prints to celebrate the 50th anniversary of Catoctin High School. The prints are of Thurmont High School; Emmitsburg High School; and Catoctin High School, as it looked when it opened fifty years ago. The artwork was commissioned especially for Catoctin High School and created by talented artist Kim Flabbi. Kim is a long-time staff member of Catoctin High School, as well as a former coach and student. “I was very excited and feel honored to have been asked to create this artwork for my alma mater to celebrate this special anniversary,” said Flabbi. The school is selling fifty numbered and artist-signed prints, ready for framing. Proceeds from the sale will benefit the Catoctin High School Distinguished Graduate program, which recognizes outstanding alumni. To purchase a print, visit Catoctin High School’s main office between 7:30 a.m.-3:00 p.m. If you have questions, call the school at 240-236-8100. Kim Flabbi with a custom-made print. The price tag is approximately $7,500 for a new piece of equipment. To fill this need, financial donations may be mailed to: CHS Sports Boosters, 14745 Sabillasville Road, Thurmont, MD 21788. The Boosters Club has also set up a GoFundMe account and donations can be made by going to www.gofundme.com<http://www.gofundme.com> and entering “Utility vehicle for Catoctin Athletics” in the search bar. The Athletic Department would like to have its new utility vehicle by the start of the fall sports season in August. Sister Brenda Monahan, D.C., principal, is pleased to announce that Sharon Beard was chosen to receive the 2019 Friends of Catholic Education Excellence in Teaching Award for Mother Seton School (MSS). Beard has been an educator for thirty-four years, serving thirty of those years in Catholic education, specifically. For the past five years, Beard has taught fourth and fifth grade at MSS. 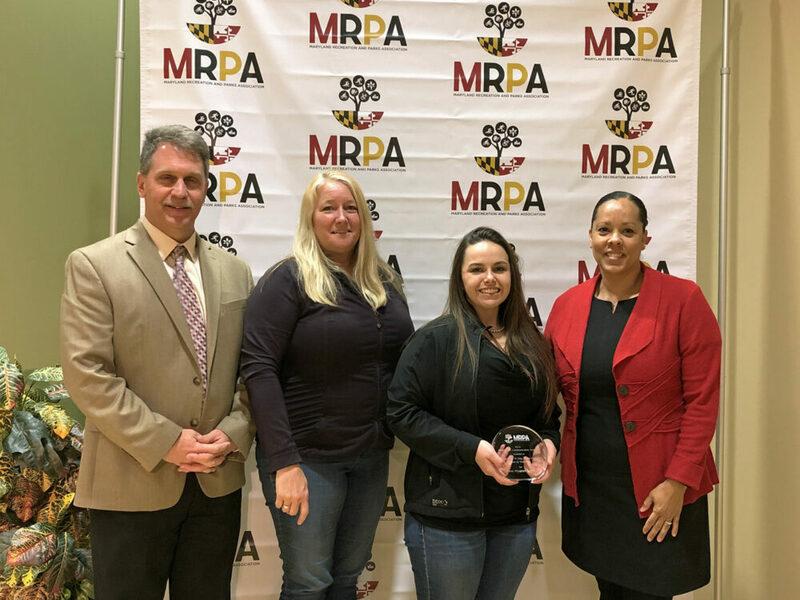 She was selected as this year’s recipient in recognition of her dedication and willingness to go above and beyond for her students and the school. Most recently, she helped the school to acquire a grant for a Makerspace program, where children are given a variety of digital and “old-school” tools and resources to express their creativity. Beard holds a Master’s degree in elementary education and has taught grades from pre-K through fifth grade. She also has a degree in music, has served as acting principal, has led accreditation efforts, including serving as chairperson, and was a lead teacher in the Middle States accreditation efforts. She has also served as a mentor to interns and student teachers helping to instill best practices and offering support to new professionals entering the field. 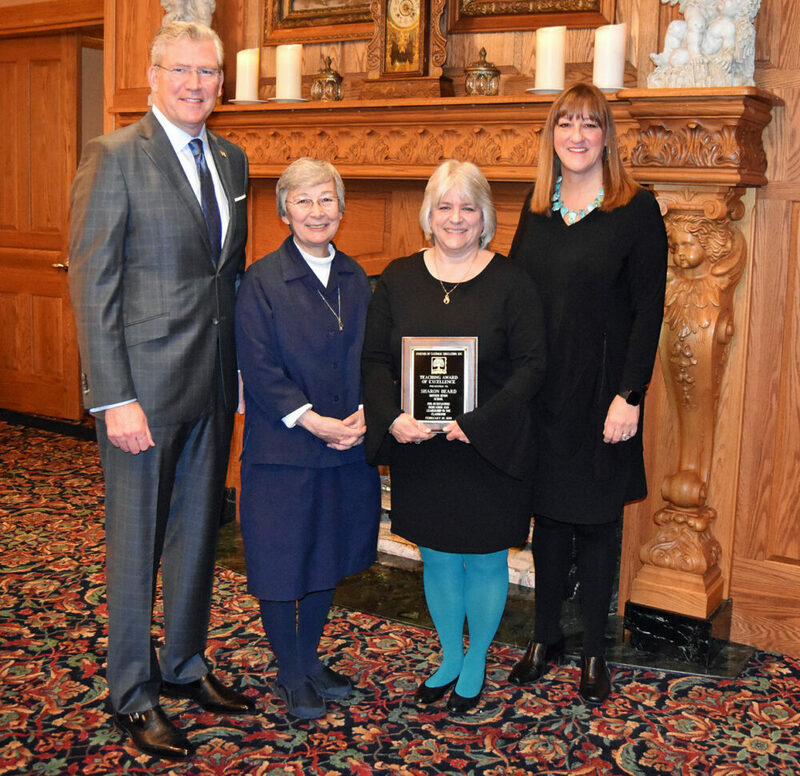 Pictured from left are Bill Milani, president of Friends of Catholic Education Board of Trustees; Sister Joan Corcoran, Mother Seton School mission integration coordinator; Sharon Beard, MSS Teacher of the Year; and Michelle Corr, executive director of FOCE. 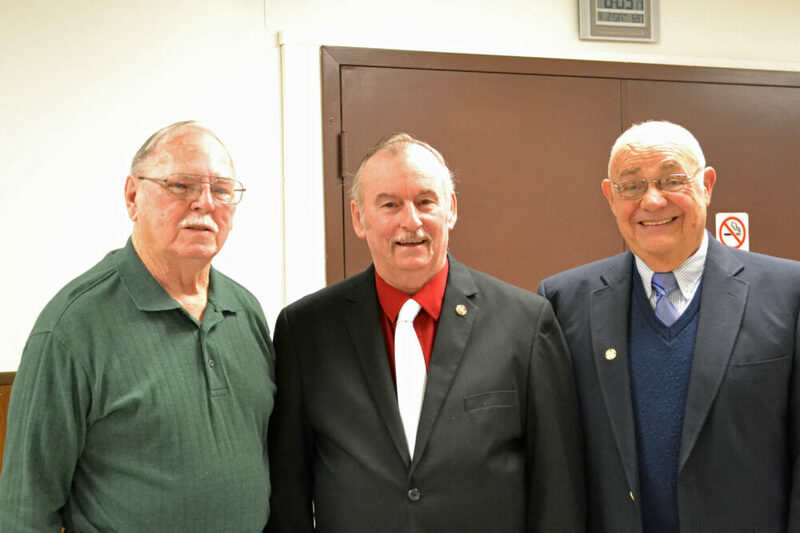 Since 1995, Thurmont Masons have awarded Scholarships worth over $95,000 to area students! Scholarships are available to all graduating high school level seniors from a Maryland State accredited public, private, and/or home-school program who reside within the Catoctin High School district boundaries as per the Frederick County Public School district map. Scholarship application forms are available at the Catoctin High School Guidance Office and the Thurmont Public Library. Interested students must complete an application and return it to the location where it was obtained on or before April 30, 2019. The successful applicant and family will be invited to Acacia Lodge’s Annual Strawberry Festival in June for the presentation of the Scholarship. Questions regarding the application should be directed to Acacia Masonic Lodge #155, attn: Scholarship Committee via the Lodge website at www.thurmontmasons.com.